"We boarded the boat as a tour group herd amongst many and set off. The boat tour was nice and the seafood lunch served was okay, but not memorable. But for $19 for the whole tour, who can complain. The bay holds 1,969 islands made of limestone and schist. The formations are due to erosion called karsts and boy, they stand majestic! Huge rock karsts shoot up from the ocean, standing a mountain high. It makes you feel small. I felt like I was in a different land and time completely, some mythical movie, like The Land that Time Forgot. I was waiting for terradactyls and dinosaurs to pop out. Fishermen�s houseboats and floating fish markets buoy on the bay. Meanwhile, tourists can kayak to see the formations up close. We weren�t the only boat tour� not by a long shot. There were as many boats there as there are speedboat tours to the Phi Phi islands in Thailand. It kills the romance a bit to know you�re part of a herd in a crowd of several herds. Halong Bay is still worthwhile to see." 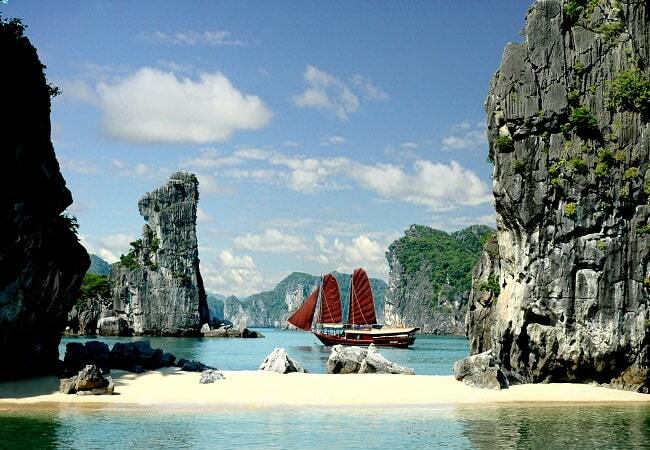 Ha Long Bay - (also called "Halong Bay") is in the north of Vietnam about 4 hours drive from Hanoi. From this capital city are frequently booked the trips and made. "Ha Long" means "Bay of the Descending Dragon" and consists onion 1969 islands, most of which are uninhabited. The limestone islands stabbing vertically out of the sea. This is called a karst phenomenon. Although you can visit Halong Bay throughout the year, it is better to plan your cruise carefully. Bad weather can affect what you get to see. 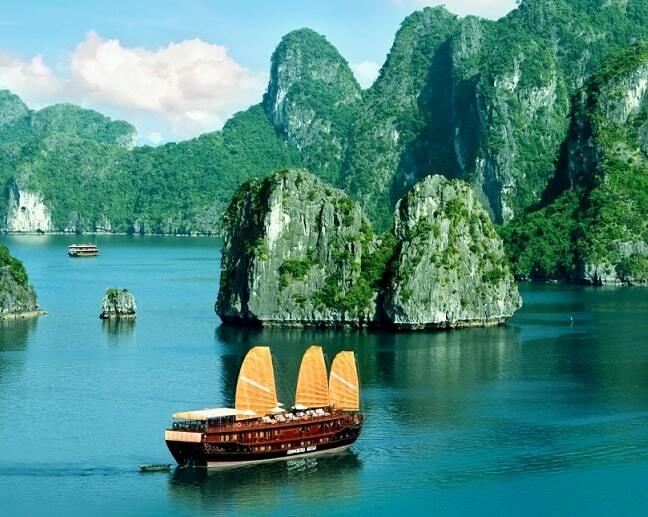 The best time to Ha Long Bay to visit is from March to June. Then you have to avoid the busy holidays (April 30 and May 1). From June to September is the low season, so you can close better deals, but pay attention to the forecasts of storms in the area. October and November is not crowded and the weather is always sunny. This is perhaps the best time for a visit. December is cool, cloudy but dry, while January and February can be cold, foggy and drizzly. The rain will hide the beauty of the bay. The departure of the junks (a beautiful, specifically Asian, antique, wooden ship) is Ha Long City. The ships are often beautiful to look at and beautifully decorated. 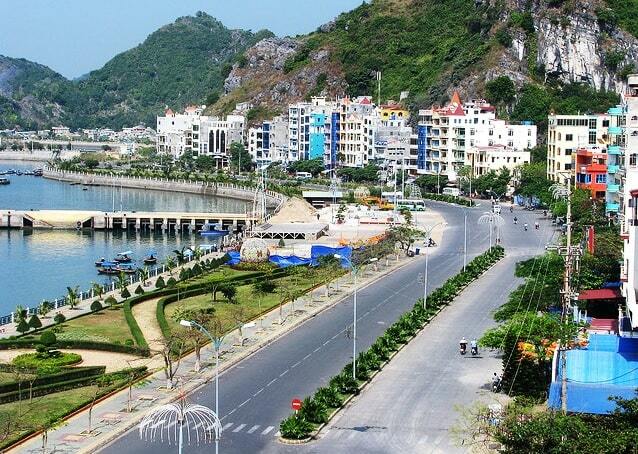 Ha Long is a bland, gritty town with high-rise hotels along the coastline. Many travellers choose to skip the town of Ha Long. At the harbour it is usually crowded at boarding. If you have booked a tour in Hanoi, you'll travel with a good coach. Trip yourself that you can take bus or train. The train trip takes two hours. You can book a one-day tour of four hours to a multi-day tour on the junks. It is recommended to spend two nights on such a junk. You will receive full board and you get a basic cabin on board. There are small junks, but also large. On the big junks you'll find a restaurant with beautiful, tasteful formatted tables. 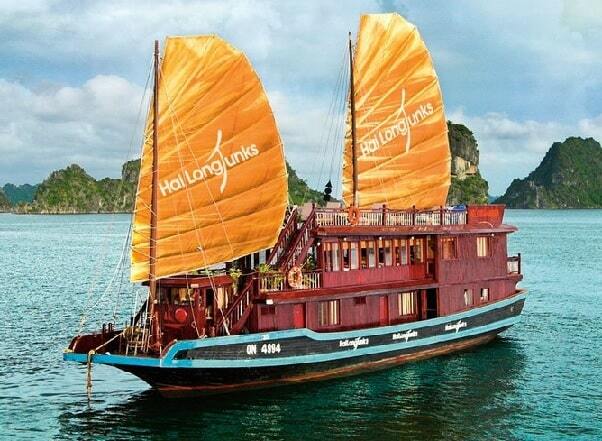 With traditional junk you'll explore in two or three days the scenic perpendicular towering islets of Ha Long Bay. During the day you sail between the karst islands and floating fishing villages, visit ancient caves and in between you also have plenty of free time to sunbathe and swim in the most idyllic spots in the bay. Note the flow, which can sometimes dangerous. On a beautiful sunset, the junk anchors at one of the islands and you can enjoy a traditional Vietnamese meal onboard. As dusk begins, you'll see dozens, cozy little 'junks' in the neighbourhood. The largest island in Halong Bay is called Cat Ba and it's worth a visit. Cat Ba is the most famous island of the bay and in almost all the excursions you can even disembark here. Here you can visit the Cat Ba National Park. The park has a lot of exotic animals and plants and it has also stunning views over the bay of Ha Long. The easiest means of transport to get there is the motorbike. The journey takes about half an hour. Indeed, there are a lot of elevation changes and sometimes you have beautiful views of the bay. At the harbour of the town Cat Ba runs also a bus to the entrance of the Park. The animals, which live among others in this Park are macaques, deer, civets and various types of squirrels, including the giant black squirrel. Seventy species of birds have been spotted here, including hawks, hornbills and cuckoos. Cat Ba also is a major migration route for waterfowl. The impressive towering islands of Halong Bay's makes the trip special, but what is inside of those islands located is just special. Inside you'll find huge rooms full of ancient rock, in the most bizarre shapes and sizes. Most caves are also beautifully illuminated with coloured lights, and that makes for a breathtaking spectacle. From Cat Ba you can visit some of these caves, but keep in mind that the most famous caves (especially weekends and holidays) are frequently visited by tourists. I recently toured Bai Tu Long Bay with a friend aboard the Dragons Pearl for 2 days/3 nights. Every step of planning this portion of our Vietnam trip was with ease. The communication between myself and the Indochina Junk was great, quick responses and perfect English. We pre-arranged to be picked up at one hotel in Hanoi and dropped at another. This was all relayed for us and very organized. The Luxury vans had Wifi and were spacious. The actual boat was gorgeous, enough room for everyone on deck, especially top deck where the views are once in a lifetime the entire trip. The food was delicious, they accommodated all dietary needs and the service was excellent. Obviously you are in this part of Vietnam for the views...and they did not disappoint! We were lucky with great weather albeit a little chilly - but clear and dry! I can understand ones disappointment if this is not the case, but as far as any detail that the tour company can ensure (clean boat, service, food, cabins, luggage, transfers etc) they hit all high marks. I HIGHLY recommend them, and particular boat!